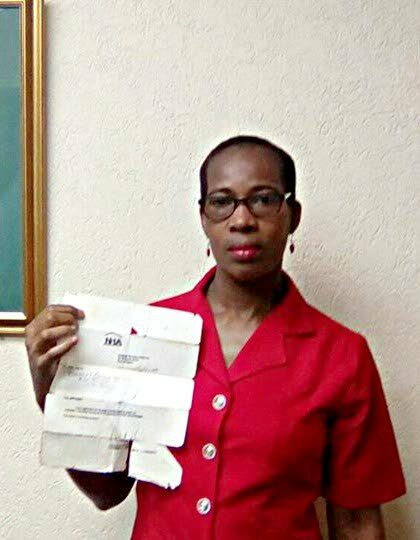 Beverly Mulraine shows an aged copy of a letter she received from the now defunct National Housing Authority from 1998, acknowledging receipt of her application. Beverly Mulraine has been waiting for a house for almost 20 years, when she applied for a home under the now defunct, National Housing Authority (NHA), the precursor organisation to the current Housing Development Corporation (HDC). Today, Mulraine’s home is dangerously close to collapse as increased rainfall threatens to destroy the wooden, one-bedroom structure which is situated on a slope. Mulraine visited Newsday’s Port of Spain office yesterday saying she visited the HDC several times over the past 19 years and despite continuous reassurances, she is no closer to finding a home. Mulraine is calling on the relevant authorities to look into the matter and says that she has made repeated attempts to contact surveyors and officials from the HDC but to no avail. She says that while she has sought to try and minimise the effects of weathering, the house will inevitably crumble. Reply to "20 years later, woman waiting on HDC"